The ArtRage Motor Sports Series Number 6. By the time I was old enough to get excited about auto racing, Team Lotus had become the media darling of the moment. 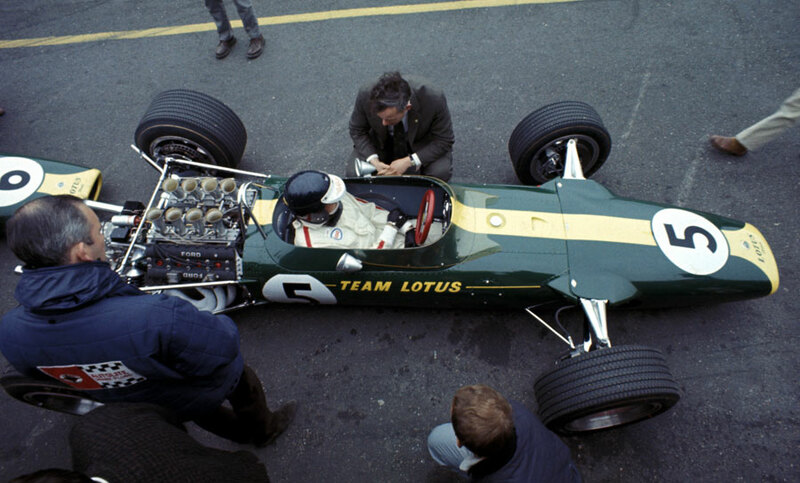 With the introduction of the Lotus 49, they had successfully transformed the design of Formula 1 cars to what would become the basic design base used even today. Yes the technology has improved light years since the mid 60’s, but the transition from front mounted to rear mounted engines was huge. My memories of auto racing in the late 60’s and early 70’s can be summed up like this; “All races were between Mario Andretti, and Jackie Stewart. All the cars in the race are a Lotus 49, although the colors are vary.” It’s kind of like memories of football games. They all have the Green Bay Packers playing what ever team, and it’s snowing. 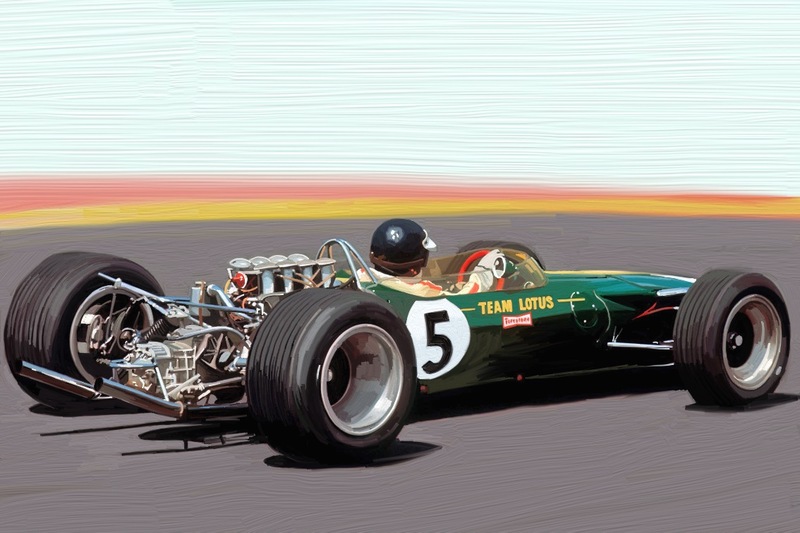 The image below is a Lotus 49, piloted by Jim Clark at the 1967 Dutch Grand Prix. I never saw the race. If I had my memory of it would be so vague it wouldn’t mean anything, since I would have been 5 and a half. The race was watched by 80,000 spectators under over cast skies at Zandvoort in Holland. In my image, Jim Clark races under sunny skies, past a crowd of none. He doesn’t have a care in the world as he moves out at 165 miles per hour away from the pack. The second image is one of the reference photos I pulled before starting this paining. Take a good look at that photo and take note of what is missing. That’s right seat belts. As late as 1967/68 seat belts were not required on racing cars that were averaging 160 miles per hour. Posted in Automobiles, Design and Art, iPad Apps, Postaday 2011 and tagged Artrage, Dutch Grand Prix, Formula 1, Jim Clark, Lotus, postaday 2011, postaday2011, Team Lotus, Zandvoort on December 11, 2011 by Author.